Mix broth, cornstarch, oyster sauce and pepper sauce; set aside. Heat oil in 10-inch nonstick skillet over medium-high heat. Cook garlic and frozen vegetables in oil about 5 minutes, stirring frequently, until vegetables are crisp-tender. Stir in coleslaw mix and broth mixture. Cook and stir 1 1/2 minutes. Serve over noodles. 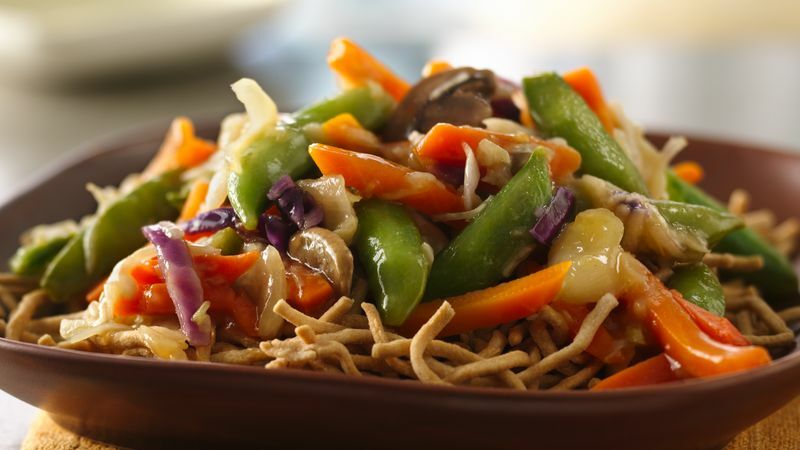 For Easy Chicken Chow Mein, add 2 cups cubed cooked chicken or turkey with the frozen vegetables in step 2, and continue as directed. Oyster sauce is a thick, brown sauce made from oysters, salt and starch. If oyster sauce isn’t available, you can substitute 1 tablespoon soy sauce.